Left to right, here are Lilly, Rosey, Pancho Villa and Buccaneer. Lilly is a 6 year old long haired mini dapple Doxie. Rosey is 8 and a short haired dapple Doxie. Pancho Villa is a 2 year old longhaired chocolate and white Chihuahua. And Buccaneer is a Long haired double dapple Doxie and is 4 years old. I got them from breeders and the pet store. I got each of them at the age of 8 weeks old. They like to chase birds and squirrels, travel, ride quads, attack and rip out the stuffing of squeaky dog toys. I call this picture "The Tail's End". 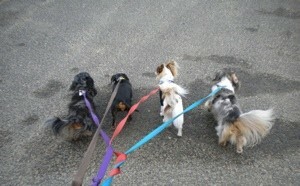 It can be quite a challenge at times to walk 4 dogs at once, I'm glad that they are small! Buccaneer looks just like my little Stewie. Is he ok? Stewie has one undeveloped eye and one kinda cross-eyed eye, so he doesn't see well. I don't think he hears well either. But he is a beautiful dog and we love him. Is Cat Food OK for Dogs?